This is an interesting photo with many details. 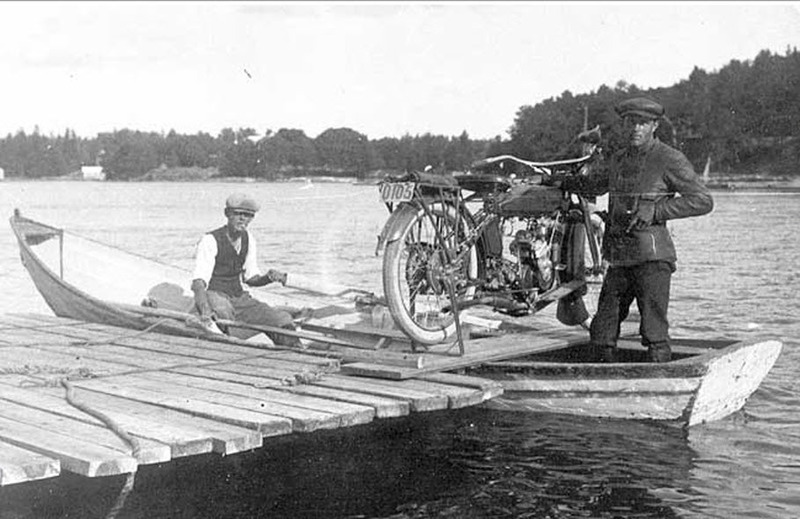 First of, would you have crossed a lake by a wooden barge with your beloved motorcycle resting on two planks across the gunwale? I would have attached some ropes as a start. The bike D-105 is a very interesting one, a 1916 or 1917 Harley model C single where the rear cylinder is replaced by a Dixie magneto? This fact is easily seen by the angle of the timing gear cover (pointing upwards). According to the brilliant site; http://www.techsweb.us/hdvin.html there where only 862 of these tiny 35"`s (500cc) made in 1916 and even less, 605 bikes in 1917. One can only wonder why the owner decided to order this model rather than a mighty big twin with loads of punch. Article in the last issue of HDOCN mag.